Laminectomy is a surgical procedure for decompressing the cord or nerve roots by removal of lamina part of the vertebra which forms the vertebral or neural arch. Each vertebra contains two laminae and the procedure may remove one or both laminae. Removal of the single lamina is called hemilaminectomy. The main aim of the laminectomy is to relieve the pressure on the nerve tissues. It can be done as the stand-alone procedure or may be done as part of some other procedure. For example, laminectomy may be done to access the disc better for its removal. Laminectomy is most commonly done in the lumbar spine. It is done less often in the cervical spine and even more rarely in thoracic. Spinal stenosis is the most common indication of laminectomy. Discectomy also involves cutting of lamina but most of the surgeries now preserve lamina or do partial laminectomy only. Depending on the disease levels, the laminectomy may be done for a single vertebra or multiple levels. In some cases, spinal fixation and fusion may be done. Fusion aims at prevention of the recurrence. Laminotomy is the removal of a small portion of the lamina and ligaments. It is usually done on one side., usually on one side. This procedure is often done for accessing the disc. It has the advantage of leaving the lamina in place, decreasing the chance of postoperative spinal instability. Each vertebra consists of an anterior body which is attached to a posterior ring called the posterior neural arch. Two struts of bones called pedicles arise from the body and join two converging struts called laminae. Pedicles, laminae and posterior surface of the body forms boundaries of the spinal canal. This spinal canal is the space where spinal cord passes. There is a transverse process on either side of the arch which serves as an attachment to various muscles and ligaments. Dead posteriorly is the posterior spinous process that can be felt on our back as bumps. Posterior spinous processes also serve as an attachment to ligaments and muscles of the spine. Adjacent to the base of transverse processes are bony projections that go superior and inferior. These are called superior and inferior articular facets and take part in the formation of facet joints. There are two facet joints between each between each pair of vertebrae one on each side. They are primarily designed to allow the vertebral bodies to rotate with respect to each other. The lamina is a posterior arch of the vertebral bone lying between the spinous process and the pedicles [which then connect to the vertebral body completing the arch] and the transverse processes of each vertebra. General anesthesia is used for this surgery. Laminectomy is performed by midline posterior approach and the patient is placed prone on a spinal frame. The operative site is radiographically localized. The proposed midline incision site is marked and the surgical field prepared and draped. The incision site is infiltrated with 1% lidocaine mixed with 1:100,000 epinephrine. The incision extent varies on the vertebrae involved. Place a midline incision after confirming the vertebral levels and marking the extent. Cut the subcutaneous in line. The paravertebral fascia is cut on either side of the spinous process and leaving a rim of tissue between two processes intact. 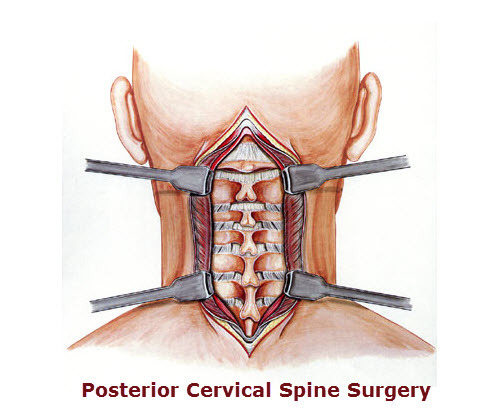 [Classical laminectomy removes the spinous process as well]. Retract with right-angled retractors and using sharp wide osteotomes, the paraspinal muscles are erased from the posterior part of vertebrae. The paraspinal muscles are stripped from the spinous processes using a subperiosteal technique down along the laminar to the edge of the facets either bluntly or with monopolar cautery. Following adequate exposure and hemostasis, the levels to be decompressed are accurately are confirmed with the image intensifier. In a classical laminectomy, the spinous process is removed and from thereon, the lamina is cut with a high-speed drill or rongeurs. In severe stenosis, the dura should be well protected with either instrument. The thickened ligamentum flavum that connects the laminae of the vertebra below with the vertebra above is also removed. For decompression of the spinal nerve, the facet joints [directly over the nerve roots] may be trimmed to provide more space to the nerve roots. This procedure is termed as foraminotomy and could be done along with the laminectomy or laminotomy. Not more than 50% of the facet should be removed to prevent joint instability. A more extensive foraminotomy to laterally decompress the exiting nerve root will require additional removal of the superior and inferior facet complex. Bleeding points from bone are most effectively controlled with bone wax. Surgicel (oxidized cellulose) and Gelfoam (Gelatin) act through chemical and direct contact activation of the clotting cascade. After adequate decompression and hemostasis is achieved, the operative site is generously irrigated with saline or lactated ringers solution, with or without antibiotics. When the dura is opened, antibiotics are avoided. The incision is then closed in layers and the skin secured with sutures, staples, or skin adhesive. This is done on each side for each affected vertebrae. Often the laminectomy is done as part of discectomy. In such cases, the spinous process is not removed. The surgery may be aided by the use of the surgical loupes or a microscope may be used at any time during the procedure. Once the lamina and ligamentum flavum are removed the protective covering of the spinal cord (dura mater) is visible. The surgeon can gently retract the protective sac of the spinal cord and nerve root to remove bone spurs and thickened ligament. The decompression effect is generally visible on the neural tissue which is examined for any residual compression. If present, the residual compression is removed. In selected cases, the decompression may be followed by surgical stabilization and bone grafting for spinal fusion. After the desired surgery, the e muscle and skin incisions are closed in layers. The following video shows a lumbar laminectomy demo. Stitches are removed after 10-14 days. Depending upon the type and levels of surgery, the patient may be allowed to walk in immediate postoperative period or has to wait for few days. The patient needs to avoid activities that strain the back. These could be lifting a heavy weight or household activities that require repeated or constant bending of the spine. Most people report measurable improvement in their symptoms after laminectomy recurrence of arthritis. Decompressive laminectomy is successful in relieving leg pain in 70% of patients allowing significant improvement in function. However, back pain may not be relieved and 17% of older adults need another operation. Symptoms may return after a few years. Endoscopic laminotomy results in lesser blood loss, shorter hospital stay, and less postoperative pain drug requirement. Smoking has been associated with poorer results.